Uremia impairs the atheroprotective properties of HDL, but the mechanisms underlying why this occurs are unknown. Here, we observed that HDL isolated from healthy individuals inhibited the production of inflammatory cytokines by peripheral monocytes stimulated with a Toll-like receptor 2 agonist. In contrast, HDL isolated from the majority of patients with ESRD did not show this anti-inflammatory property; many HDL samples even promoted the production of inflammatory cytokines. To investigate this difference, we used shotgun proteomics to identify 49 HDL-associated proteins in a uremia-specific pattern. Proteins enriched in HDL from patients with ESRD (ESRD-HDL) included surfactant protein B (SP-B), apolipoprotein C-II, serum amyloid A (SAA), and α-1-microglobulin/bikunin precursor. In addition, we detected some ESRD-enriched proteins in earlier stages of CKD. We did not detect a difference in oxidation status between HDL isolated from uremic and healthy patients. Regarding function of these uremia-specific proteins, only SAA mimicked ESRD-HDL by promoting inflammatory cytokine production. Furthermore, SAA levels in ESRD-HDL inversely correlated with its anti-inflammatory potency. In conclusion, HDL has anti-inflammatory activities that are defective in uremic patients as a result of specific changes in its molecular composition. These data suggest a potential link between the high levels of inflammation and cardiovascular mortality in uremia. Because qualitative alterations of HDL are directly linked with increased cardiovascular complications, we hypothesized that HDL from ESRD patients on maintenance hemodialysis might display defective anti-inflammatory potency, protein cargo, and/or oxidative status. In this study, we describe a loss of anti-inflammatory efficiency along with an altered HDL protein composition in ESRD patients compared with HDL from healthy controls. Surprisingly, the HDL of ESRD is not oxidized or more vulnerable to oxidation. After pinpointing the molecular composition of HDL, we link the molecular changes with the proinflammatory function of uremic HDL. The potential clinical relevance of this novel immunomodulatory activity of HDL and its impaired function during uremia is discussed. HDL was recently identified as a major endogenous inhibitor of inflammatory responses.45 We speculated that the chronic inflammatory milieu observed in ESRD patients might be linked with a defective anti-inflammatory potency of HDL. Therefore, we isolated HDL from ESRD patients and healthy individuals by sequential ultracentrifugation (Supplemental Figure 1).46 Next, we stimulated peripheral human monocytes with the Toll-like receptor 2 (TLR2) agonist Staphylococcus aureus (SAC) in the presence or absence of 10 or 100 µg/ml HDL and measured the inflammatory response. We observed that HDL from healthy individuals potently inhibited the production of the inflammatory cytokines IL-12p40, TNF-α, and IL-10 after stimulation with SAC (Figure 1, A–C). Strikingly, in the majority of cases, HDL from ESRD patients did not show these potent anti-inflammatory effects, but in contrast, many ESRD-HDL samples promoted inflammatory cytokine production (Figure 1, A–C). Of note, the apoA-I mimetic peptide 4F did not modulate the expression of these cytokines (data not shown). Moreover, dendritic cells stimulated with LPS showed a reduced expression of the costimulatory molecules CD40, CD83, and CD86 in the presence of HDL isolated from healthy controls (Figure 1D). In contrast, the HDL from ESRD patients showed a diminished ability to inhibit the surface expression of these molecules (Figure 1D). These results show that uremic HDL from ESRD patients displays defective anti-inflammatory properties with regard to innate immune responses. Defective anti-inflammatory potency of HDL from ESRD patients. (A–C) Human monocytes were pretreated with HDL from ESRD patients (ESRD-HDL; n=27) or HDL from healthy controls (control-HDL; n=7) and then stimulated with SAC for 20 hours. The amount of (A) IL-12p40, (B) TNF-α, and (C) IL-10 was determined in the supernatant and is expressed relative to cells stimulated with SAC only. The individual values and the median are shown in the scatter plots. (D) Monocyte-derived dendritic cells were treated with 100 µg/ml HDL from 4 healthy controls (control-HDL) or 10 ESRD patients (ESRD-HDL) and then stimulated with LPS for 20 hours. The expression of the indicated surface markers was evaluated by flow cytometry and is expressed relative to cells stimulated with LPS only. *P<0.05, ** P<0.01, ***P<0.001. To investigate potential causes for the defective anti-inflammatory potential of ESRD-HDL, we analyzed the oxidation status of ESRD-HDL, because oxidized HDL promotes inflammation and atherosclerosis. Accordingly, we measured the levels of oxidized apoA-I and -II in HDL from ESRD patients by HPLC using an assay that detects oxidized methionine residues, which is an early event during HDL oxidation.25,26,47–49 We detected a decrease in the relative content of total apoA-I and -II in freshly isolated HDL from ESRD patients compared with controls (Figure 2A). Surprisingly, we were unable to detect oxidized apoA-I or -II in HDL in either ESRD patients or healthy controls (Figure 2B). To determine potential differences in susceptibility to oxidation of HDL between the two groups, we subjected isolated HDL stored for 3 days at 4°C to in vitro oxidation with a peroxyl radical generator. Interestingly, storing HDL samples alone significantly increased the content of oxidized apoA-I/II in both groups (Figure 2B). In vitro oxidation for 2 hours more augmented the extent of apoA-I/II oxidation (Figure 2B). Oxidation was associated with the loss of nonoxidized apoA-I/II (Figure 2C). When expressed as relative to the total amount of apoA-I/II, there was no difference in oxidized apoA-I/II between HDL from controls and ESRD patients (Figure 2D). These results suggest that HDL in plasma from ESRD patients is not significantly oxidized in vivo or more vulnerable to peroxyl radical-mediated oxidation than HDL from healthy controls. Amount of oxidized apoA-I and apoA-II in HDL and its susceptibility to oxidation of ESRD patients and control subjects. HDL was tested from the replica cohort consisting of 14 ESRD patients and 12 controls. The amounts of (A) total apoA-I and -II, (B) oxidized apoA-I and -II, (C) total nonoxidized apoA-I/II and oxidized apoA-I/II, and (D) the ratio of oxidized apoA-I/total apoA-I and oxidized apoA-II/total apoA-II were determined by HPLC analysis from freshly isolated HDL (Fresh), HDL that was stored for 3 days at 4°C (3d), and HDL that was stored for 3 days at 4°C and then chemically oxidized by 2,2'-azobis-2-methyl-propanimidamide (3d+AAPH) for 2 hours. *P<0.05. Because the oxidation status was similar, we speculated that the protein cargo of uremic HDL might differ compared with HDL isolated from healthy individuals. To identify HDL-associated proteins, we performed electrospray ionization-Ion Trap MS of purified HDL from 10 patients on maintenance hemodialysis and 10 healthy controls. Table 1 describes the clinical characteristics of the subjects studied. The following criteria were used to identify proteins; a high peptide identification score (Concise Methods) and at least three peptides corresponding to a protein of interest had to be detected in at least three subjects. Using these criteria, we identified 49 proteins that were HDL-associated in controls or ESRD patients (Table 2). 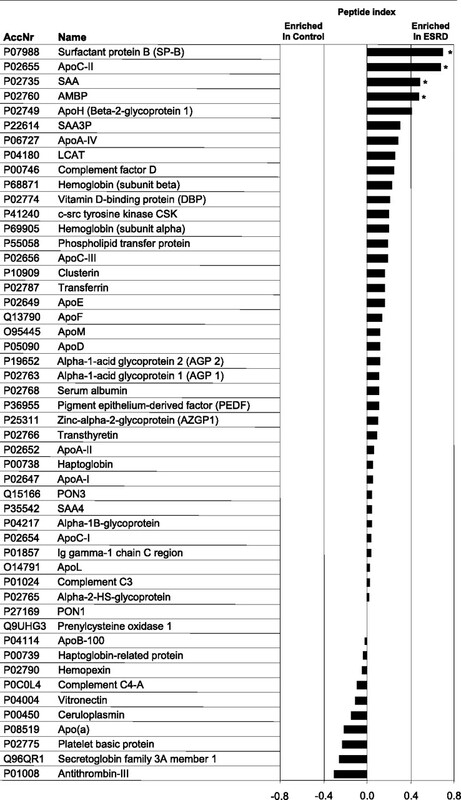 Of these proteins, 44 proteins have been described previously, and 5 proteins represent novel HDL-associated proteins. The newly identified HDL-associated proteins are α-1-acid glycoprotein 1, zinc-α-2-glycoprotein, surfactant-associated protein B (SP-B), c-src, and complement factor D (Table 2). Importantly, we confirmed our results by performing MS of HDL from an independent cohort of healthy individuals and ESRD patients (Table 1 and Supplemental Table 1). Gene ontology functional associations of HDL proteins. Total identified HDL proteins from 10 healthy controls and 10 ESRD patients were associated with biologic functions using gene ontology process annotations. HRP, haptoglobin-related protein; TTR, transthyretin; IGHG1, Ig γ-1 chain C region; PLTP, phospholipid transfer protein; A1BG, α-1B-glycoprotein; DBP, Vitamin D-binding protein; AHSG, α-2-HS-glycoprotein; VTN, vitronectin; AGP 2, α-1-acid glycoprotein 2; PEDF, pigment epithelium-derived factor; Ugrp2, secretoglobin family 3A member 1; PCYOX1, prenylcysteine oxidase 1; CP, ceruloplasmin; PBP, platelet basic protein; AGP 1, α-1-acid glycoprotein 1; AZGP1, zinc-α-2-glycoprotein; SP-B, surfactant protein B; CFD, complement factor D.
We then grouped the MS-identified proteins (Table 2) and compared the proteomic composition of ESRD-HDL with HDL from individuals with normal kidney function. To quantify differences between the two groups, we used the previously described peptide index, an empirical test based on peptide abundance to measure the relative protein abundance in different groups of subjects.40 We identified four proteins that were significantly enriched in HDL from ESRD patients according to the peptide index: SP-B, apoC-II, serum amyloid A (SAA), and AMBP (Figure 4). Indeed, SP-B was exclusively detected in HDL from ESRD patients but not healthy individuals (Table 2). These results were supported by immunoblotting the enriched proteins in HDL from the replication cohort (Figure 5). Moreover, we observed that various proteins, which were enhanced in the ESRD group but did not reach statistical significance according to the peptide index, were still highly enriched in the independent patient cohort, such as transferrin or pigment epithelium-derived factor (PEDF) (Figure 5). These results imply that distinct HDL-associated proteins are strongly enriched or exclusively present in ESRD patients. Relative abundance of proteins identified by MS from HDL of ESRD patients and healthy controls. Data are from 10 subjects with ESRD and 10 controls. The relative abundance of the HDL-associated proteins was assessed by the peptide index as described in Concise Methods. *P<0.05. Immunodetection of HDL-associated proteins in both ESRD patients and healthy subjects. Shown are immunoblots of the indicated MS-identified HDL proteins in 10 µg HDL from the replication cohort consisting of 14 ESRD and 12 healthy controls (Table 1). Next, we asked whether the presence of the proteins enriched in ESRD-HDL merely reflects their occurrence in the plasma. SP-B and PEDF were present in the plasma of control and ESRD subjects to a similar amount (Figure 6A), suggesting that HDL-associated SP-B and PEDF, but not SAA and transferrin, are exclusively incorporated into the HDL of ESRD patients by an unknown mechanism. Then, we sought to determine if the identified HDL-enriched proteins from ESRD patients can already be detected in earlier stages of CKD. Whereas in CKD3 patients, HDL-associated SP-B was detectably only in one subject, SP-B was already present in 5 of 11 HDL samples of CKD4 patients (Figure 6B). In contrast, HDL-associated SAA was already present in healthy controls but noticeably increased in CKD4 patients (Figure 6C). PEDF was not found in the HDL of CKD3 patients, whereas four CKD4 patients displayed PEDF-enriched HDL (Figure 6D). These results suggest that the incorporation of SP-B, SAA, or PEDF into HDL precedes ESRD, can already be detected in many CKD4 patients, and thus, may be evaluated as biomarkers for subsequent kidney failure, disease progression, or cardiovascular morbidity and mortality. Immunodetection of MS-identified proteins in the plasma or HDL of healthy subjects and patients with CKD3, CKD4, or ESRD. (A) Shown are immunoblots for SP-B, PEDF, SAA, and transferrin in 10 µg whole plasma of six ESRD subjects and five healthy controls. 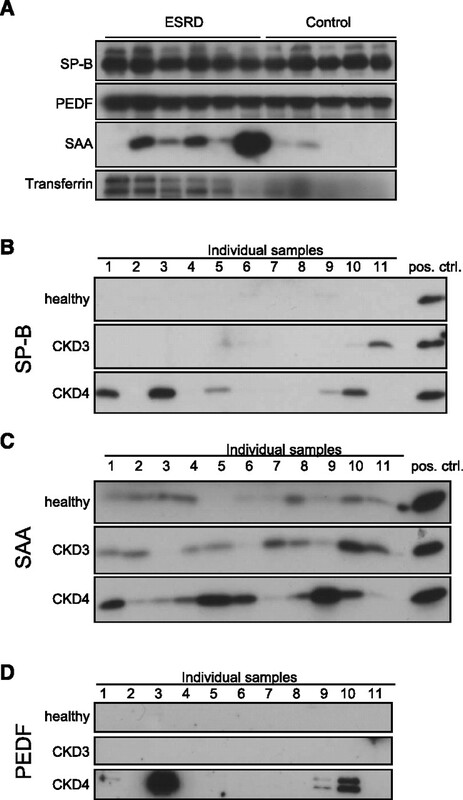 (B–D) Immunodetection of HDL-associated proteins in healthy subjects and patients with CKD3 or CKD4. Immunoblot of (B) SP-B, (C) SAA, and (D) PEDF in 10-µg HDL samples. Finally, we wanted to functionally assess the importance of the enriched ESRD-HDL proteins for the defective anti-inflammatory effects of HDL that we observed in ESRD patients (Figure 1). Therefore, we tested if SP-B, apoC-II, SAA, and AMBP might be able to induce or modulate inflammatory cytokine expression. We stimulated human monocytes with increasing doses of the proteins and observed that SAA, but not the other proteins, potently induced the expression of IL-12p40, IL-10, TNF-α, and IL-6 (Figure 7, A–D). Moreover, only SAA significantly enhanced the production of these inflammatory cytokines induced by SAC or LPS (Figure 7, E–H) (data not shown). Next, we directly tested whether SAA can revert the anti-inflammatory effects of HDL. We incubated plasma from a healthy individual with SAA or PBS and afterward, isolated HDL (SAA-HDL and Ctrl-HDL, respectively). We observed that SAA readily incorporated into the SAA-HDL particle (Figure 8A). Functionally, Ctrl-HDL potently inhibited IL-12 and TNF-α production in LPS-stimulated monocytes, whereas the incorporation of SAA abrogated the anti-inflammatory action of HDL (Figure 8, B and C). Finally, we assessed whether the amount of SAA in the HDL of ESRD patients correlated with their defective anti-inflammatory potential (Figure 1). Notably, SAA significantly correlated with the amount of IL-12 production (Figure 9A), whereas the levels of IL-10 and TNF-α did not correlate with SAA (Figure 9, B and C). These results suggest that the incorporation of SAA into HDL contributes to the reduced anti-inflammatory or sometimes, even proinflammatory potency of HDL in ESRD patients. SAA, but not SP-B, apoC-II, or AMBP, mediates the proinflammatory effects of ESRD-HDL. Human monocytes from three individual donors were treated with the indicated concentrations of SAA, SP-B, AMBP, or apoC-II (in ng/ml) without (A–D) or together with 20 µg/ml SAC (E–H) for 20 hours. The amount of (A and E) IL-12p40, (B and F) TNF-α, (C and G) IL-10, and (D and H) IL-6 was determined in the supernatant and is expressed as means ± SEM. *P<0.05, **P<0.01, ***P<0.001 compared with the respective SAC controls. SAA reverses the anti-inflammatory effects of HDL. (A) Immunoblot of 3.5 µg HDL isolated from plasma of a healthy individual incubated with PBS (Ctrl-HDL) or SAA (SAA-HDL). As control, 5 ng SAA was loaded. (B and C) Human monocytes were pretreated with Ctrl-HDL or SAA-HDL (µg/ml) and then stimulated with 100 ng/ml LPS for 20 hours. The amount of (B) IL-12p40 and (C) TNF-α was determined in the supernatant and is expressed relative to cells stimulated with LPS only (n=3). *P<0.05, **P<0.01, ***P<0.001. SAA in ESRD-HDL correlates with IL-12p40 expression. The expression values of human monocytes stimulated with 20 µg/ml SAC together with 10 µg/ml ESRD-HDL (Figure 1, A–C) were used to correlate SAA levels and the expression of (A) IL-12p40, (B) IL-10, and (C) TNF-α. Pearson’s correlation coefficient r was used as measure for the correlation analysis. The molecular causes for the excessive cardiovascular morbidity and mortality of uremic patients are only incompletely understood. Recently, it has been documented that HDL from patients with ESRD is dysfunctional and unable to inhibit oxidation of LDL, a cardinal attribute of the antiatherogenic property of HDL.32 The molecular basis for the dysfunctionality of ESRD-HDL is unresolved. We now show that HDL from ESRD patients is also defective in a recently described anti-inflammatory function (i.e., the direct inhibition of inflammatory cytokine production in innate immune cells).45 To identify possible features that might distinguish healthy from uremic HDL, we analyzed the molecular composition of the HDL proteome in ESRD patients by shotgun proteomics. Our analysis identified many proteins that have been previously assigned to uremia and CKD, such as SAA, hemoglobin, transferrin, lecithin:cholesterol acyltransferase, ceruloplasmin, antithrombin-III, or apoA-IV, which is also a novel independent predictor of CKD progression.52,53 Moreover, these data revealed that a specific set of proteins, including SP-B, apoC-II, SAA, AMBP, transferrin, and PEDF, define the molecular organization of HDL from ESRD patients. Notably, SP-B, SAA, and PEDF were already broadly detectable in HDL from CKD4 patients. The early appearance of these proteins shows that the observed compositional changes are caused by uremia per se and not merely by bioincompatibility or the mechanical-induced trauma caused by hemodialysis; however, the functional relevance of the identified proteins for HDL biology needs to be determined in additional studies. Interestingly, the set of proteins most strongly enriched in HDL from ESRD patients does not overlap with proteins reported to be enriched in HDL from patients with coronary artery disease, namely apoC-IV, PON1, C3, apoA-IV, and apoE.40 These results support a novel concept that distinct diseases with atherosclerotic and cardiovascular risk are associated with a characteristic disease-specific HDL proteome. Notably, SP-B was selectively found in HDL of ESRD and CKD4 patients, but it did not exist at all in HDL from healthy subjects. The groups had comparable plasma concentrations of SP-B, showing that the mechanism responsible for SP-B incorporation into HDL is restricted to uremia. Plasma SP-B has recently been identified as a novel biomarker in chronic heart failure.54 Because pulmonary edema and pleural effusion are common in chronic heart failure and ESRD, we hypothesize that fluid overload, retention, and/or cardiac dysfunction characterized by diastolic dysfunction along with increased pulmonary resistance55 result in the release of SP-B with distinct physicochemical properties into plasma that may become incorporated into the HDL. Consequently, HDL-associated SP-B in CKD4 and ESRD patients might be an early indicator for fluid overload, cardiovascular events, and/or progression of CKD. Additional studies are urgently warranted to assess the potential of SP-B as a novel biomarker for cardiovascular morbidity and mortality in uremia. By investigating the functional properties of the enriched proteins to modulate inflammatory responses, we observed that SAA, but not SP-B, AMBP, or apoC-II, was able to induce the production of IL-12, IL-10, TNF-α, and IL-6 from human monocytes. In addition, SAA acted in concert with SAC or LPS (Figure 7) (data not shown) to augment inflammatory cytokine production. Strikingly, incorporation of SAA into healthy HDL reverted its anti-inflammatory effects. Moreover, the levels of SAA in ESRD-HDL significantly correlated with the inability to inhibit IL-12 production by ESRD-HDL. SAA is known to bind to HDL,56 and SAA is systemically increased in uremic patients.37,57 SAA was present in ESRD-HDL at a mean concentration of 7.07 µg/mg HDL. Hence, in ESRD serum that contains ∼40 mg/dl HDL, the SAA levels in HDL should be around 2.8 µg/ml. This level is in agreement with the total SAA levels measured in ESRD serum (3.7 µg/ml)58 and indicates that the majority of SAA is bound to HDL. These results suggest that SAA is a critical component of ESRD-HDL responsible for its defective anti-inflammatory potency. This finding is in line with recent evidence suggesting that SAA modulates innate immune responses59 by inducing the secretion of IL-8 in neutrophils60,61 and activating the inflammasome to produce IL-1β.62 These effects might be mediated by TLR2 or TLR4.63,64 Interestingly, it was also suggested that SAA may potentiate prothrombotic and proinflammatory events in acute coronary syndromes.65 Therefore, SAA might be a critical functional modifier of HDL that contributes to its anti- versus proinflammatory properties. This finding does not exclude the possibility that other proteins or lipids might be directly important for different functional aspects of the altered ESRD-HDL physiology. Evidence for the presence of oxidized HDL in lesions and plasma is abundant in atherosclerosis.23–26,66,67 Oxidized HDL not only loses critical atheroprotective functions but even acquires proinflammatory and prothrombotic properties. It has been suggested that oxidized HDL in ESRD patients may be causally linked to cardiovascular complications of uremia, but this suggestion has not been rigorously tested.23,27–29 We were unable to detect oxidized HDL in ESRD in vivo, and there was no difference in the susceptibility of HDL from control and ESRD patients to ex vivo oxidation induced by peroxyl radicals, which was assessed by the extent of oxidized apoA-I/II containing methionine sulfoxide(s). We did not determine the extent of lipid (per)oxidation in these experiments. The lipids of HDL containing bisallylic hydrogen atoms are more susceptible to peroxyl radical-mediated oxidation than the methionine residues of apoA-I/II.47 Therefore, we cannot exclude the possibility that there are differences in the oxidation state and/or oxidation resistance of the lipid moiety of HDL from control and ESRD patients. We consider such a possibility as unlikely, however, because the primary and major lipid oxidation products formed during the early stages of HDL oxidation (i.e., hydroperoxides of phospholipids and cholesterylesters) react with and convert methionine residues of apoA-I/II to the corresponding methionine sulfoxides.47 Thus, if there were substantial differences in the extent of lipid oxidation between HDL from control and ESRD patients, we would have expected these differences to translate into differences in the extent of apoA-I/II methionine oxidation, which we did not observe. In conclusion, our systematic analysis of the HDL proteome identified a set of novel proteins that are either unique to or greatly enriched in HDL from patients with ESRD. These molecules may be assessed as novel biomarkers to improve our ability to monitor therapeutic responses and predict meaningful future events, including cardiovascular complications. Moreover, HDL seems to be a critical part of the innate immune system, and it can be either pro- or anti-inflammatory, which is influenced by the presence or absence of SAA, respectively. Finally, our data provide a framework for evaluating novel proteins and pathways, such as heme/iron metabolism, for a direct involvement in the pathogenesis of ESRD to study the functional consequences of the complex alterations in HDL of ESRD patients. The study was approved by the ethics committee of the General Hospital Vienna according to the declaration of Helsinki (EK 407/2007 and EK 584/2009). Informed consent was obtained from all subjects. For the proteomics analysis, a total of 10 stable patients with ESRD undergoing maintenance hemodialysis for a minimum of 3 months was recruited for the study. Patients with decompensated heart failure were excluded. Patients were in a stable condition and free from intercurrent illness and infection for at least 3 months. As confirmed by clinical examination, patients were in a good state of health, notably without signs of malnutrition or wasting. All the patients were dialyzed on standard bicarbonate basis for 4–5 hours three times weekly using biocompatible polysulfone hemodialysis membranes (Fresenius, Germany). Dialysis adequacy was estimated using Kt/V values >1.2 in all patients. None of the patients had residual renal function (diuresis over 24 hours below 100 ml). The venous blood sample was drawn before the dialysis session. Blood was immediately placed on ice and centrifuged at 4000×g for 5 minutes at 4°C to obtain plasma. A group of 10 subjects with normal kidney function was used as controls. The clinical and biochemical characteristics of the patients and control subjects are given in Table 1. We used a replica cohort, which consisted of 14 ESRD patients and 12 controls (Table 1), to confirm our proteomics data. The 11 CKD3 patients (Table 2) had an estimated mean GFR of 44.1 (SD±6.9). The estimated GFR of the 11 CKD4 patients was 22.3 (SD±5.5). HDL was isolated from fresh human plasma by sequential ultracentrifugation at a density (d) of 1.063<d<1.210 kg/L.46 In brief, the density of plasma was raised by addition of KBr (Merck, Darmstadt, Germany) to 1.063 kg/L, and ultracentrifugation was carried out for 12 h at 20°C in a 50.4 Ti rotor at 50,000 rpm using an Optima L-90-K ultracentrifuge (Beckman, Fullerton, CA). After removing the supernatant with the larger lipoproteins, the density of the infranate fraction was raised to 1.210 kg/L by the addition of KBr. HDL was then collected from the top of each polycarbonate thick-wall centrifuge tube (Beckman) after another centrifugation step in the 50.4 Ti rotor at 50,000 rpm for 12 hours. To prepare SAA-HDL, we dissolved 50 µg SAA in PBS, which was added to 8 ml plasma from a healthy individual, and we incubated the mix for 3 hours at 4°C. As control, PBS was added to 8 ml plasma from the same individual. Afterward, HDL was isolated from the plasma samples. Human PBMCs were isolated as described.68 Monocytes were isolated from PBMCs by MACS using CD14 Microbeads (Miltenyi Biotec) and cultured in Macrophage-SFM medium (Invitrogen); 5×105 monocytes were pretreated for 90 minutes with 10 or 100 µg/ml HDL or medium, and then, they were stimulated with 20 µg/ml SAC (PANSORBIN; Calbiochem). Alternatively, monocytes were stimulated with the indicated concentrations of SAA (Sigma), SP-B (a gift of Andreas Günther and Clemens Ruppert, Justus-Liebig-University, Giessen, Germany69), AMBP (My-Bio-Source), or apo-CII (My-Bio-Source) with or without SAC. Cell-free supernatants were collected after 20 hours and measured by ELISA to determine IL-12p40, IL-10, TNF-α, and IL-6 levels (R&D Systems). The different protein fractions were loaded on 12% polyacrylamide gels, and electrophoresis was performed until complete separation of a prestained molecular marker was visible. Gels were fixed with 50% methanol/10% acetic acid and subsequently silver-stained as described below. The entire gel lanes were cut into six pieces and digested with trypsin as described below. Gel pieces were destained with 15 mM K3Fe(CN)6/50 mM Na2S2O3 and intensively washed with 50% methanol/10% acetic acid. The pH was adjusted with 50 mM NH4HCO3, and proteins were reduced with 10 mM DTT/50 mM NH4HCO3 for 30 minutes at 56°C and alkylated with 50 mM iodacetamide/50 mM NH4HCO3 for 20 minutes in the dark. Afterward, the gel pieces were treated with acetonitrile and dried in a vacuum centrifuge. Between each step, the tubes were shaken 5–10 minutes. Dry gel pieces were treated with trypsin at 0.1 mg/ml (trypsin sequencing grade; Roche Diagnostics) /50 mM NH4HCO3 in a ratio of 1:8 for 20 minutes on ice; then, they were covered with 25 mM NH4HCO3 and subsequently incubated overnight at 37°C. The digested peptides were eluted by adding 50 mM NH4HCO3, the supernatant was transferred into silicon-coated tubes, and this procedure was repeated two times with 5% formic acid/50% acetonitril. Between each elution step, the gel pieces were ultrasonicated for 10 minutes. Finally, the peptide solution was concentrated in a vacuum centrifuge to an appropriate volume. MS was performed as described previously.71 Peptides were separated by nanoflow LC (1100 Series LC system; Agilent) using the HPLC-Chip technology (Agilent) equipped with a 40-nl Zorbax 300SB-C18 trapping column and a 75-µm × 150-mm Zorbax 300SB-C18 separation column at a flow rate of 400 nl/min using a gradient from 0.2% formic acid and 3% acetonitrile to 0.2% formic acid and 50% acetonitrile over 60 minutes. Peptide identification was accomplished by MS/MS fragmentation analysis with an iontrap mass spectrometer (XCT-Ultra; Agilent) equipped with an orthogonal nanospray ion source. The MS/MS data were interpreted by the Spectrum Mill MS Proteomics Workbench software (Agilent version A.03.03.081), including peak list generation and search engine, allowing for two missed cleavages, and they were searched against the SwissProt Database for human proteins (version 14.3 containing 20,328 protein entries) allowing for precursor mass deviation of 1.5 D, a product mass tolerance of 0.7 D, and a minimum matched peak intensity of 70%. Because of previous chemical modification, carbamidomethylation of cysteine was set as fixed modification, and methionine oxidation was allowed as variable modification. Estimated error rates (mean of 1.3%±0.8%) were calculated from reversed database searches as previously described.72 From this rate, we automatically assigned a protein valid if it was identified with at least one specific peptide scoring above 13.0, which does not occur in other proteins identified in same samples. Protein identifications not filling that requirement were selected manually as previously described,73 where selection of protein isoforms was performed as described in the work by Zhang et al.74 Only peptides scoring above 9.0 were entered into the database. Novel HDL-associated proteins were only considered when they were also detected in the MS analysis of the replication cohort. Reduced HDL or plasma preparations (10 µg/lane) separated by 10% SDS-PAGE were transferred to a nitrocellulose membrane and probed overnight at 4°C with primary antibodies: SP-B and SAA (Santa Cruz Biotechnology), apoC-II (GenScript), apoA-I (Cell Signaling), PEDF (R&D Biosystems), and transferrin (Biodesign International). Blots were washed, incubated with appropriate secondary horseradish peroxidase-conjugated antibodies, and developed using ECL Western blotting detection reagents (Amersham). The levels of SAA in the HDL from ESRD patients were determined by the N LATEX SAA Kit (Siemens). For proteins that seemed enriched by the peptide index, unpaired two-tailed t test was used to compare the number of unique peptides identified in ESRD patients with control subjects. For proteins found in only one group of subjects, a one-sample t test was used to compare the number of unique peptides with a theoretical mean of zero. HPLC analysis of (oxidized) apoA-I/II is expressed as means ± SEM and was compared using the t test. Cytokine expression was compared using the t test. For all statistical analyses, P<0.05 was considered significant. The Pearson’s correlation coefficient r was used as measures for the correlation analysis. Calculations were carried out using GraphPad Prism (GraphPad Software). We thank Andrew Rees for critical reading of the manuscript. T.W., M.T., M.v.d.G., and M.D.S are supported by the Else-Kröner Fresenius Stiftung. R.S. is supported by a Senior Principal Research Fellowship from the National Health and Medical Research Council of Australia. This article contains supplemental material online at http://jasn.asnjournals.org/lookup/suppl/doi:10.1681/ASN.2011070668/-/DCSupplemental.